I have always loved Houndoom. After having a look at the Legends Awaken card, I decided to build a deck around this not so beastly beast. So here is a deck idea that I have been playing around with. It’s probably not top tier, but I plan to try and make it the best possible deck it can be. Let’s have a look at Houndoom LA. His first attack, “Burning Sensation”, does 20 damage for 1 Colourless Energy and will burn a Pokémon that is already damaged. His second attack, “Bright Flame”, will do 60 damage for 2 Fire Energy, but requires a flip: get heads and you have to discard both Fire Energies. So Houndoom seems to be a pretty weak attacker; and with only 80hp – he’s not exactly a tank either. That’s where his Poké-Body comes into play. “Revenge Fang” states that if you have fewer benched Pokémon that your opponent, each of Houndoom’s attacks does 40 more damage. With that factored in, Houndoom is now doing 60 for 1C and 100 for 2F (with a chance of discarding both). Houndoom suddenly becomes a pretty quick and powerful attacker. The key to making a deck work with Houndoom is to be able to manipulate your Bench so that you almost always have fewer Pokémon than your opponent. Here’s the Pokémon that accompany the hound in order to make him work at his best. All of these Pokémon have the ability to be discarded, or returned to your deck or hand, in order to allow you to control the size of your Bench. 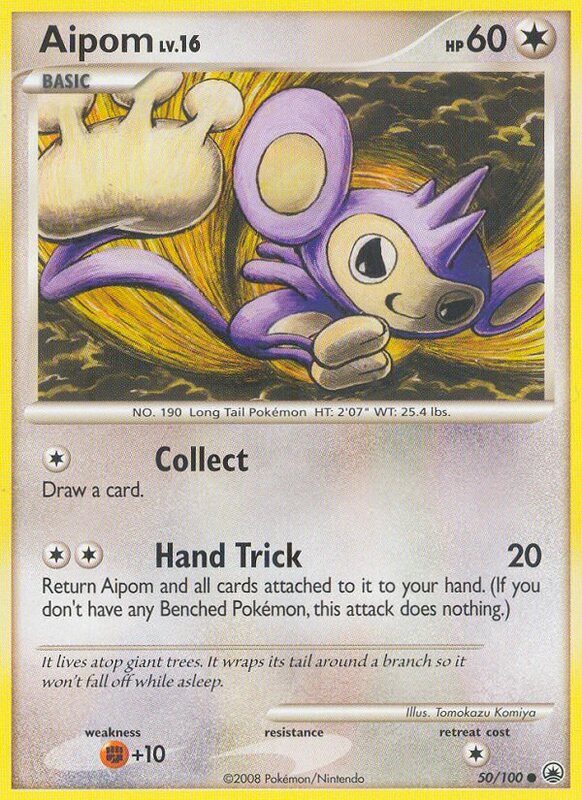 Aipom has an attack called “Hand Trick” that does 20 damage and returns Aipom and all attached cards to your hand. The cost is 2C energy, but with Double Colourless in your deck, that becomes a one turn move. Evolve to Ambipom with an attached Memory Berry and you can now use “Hand Trick” to bring a damaged Ambipom back into your hand (removing any damage at the same time). With up to four PlusPowers in your hand, when you lay them down and do “Hand Trick”, you can do up to 60 damage and have all of the PlusPowers and the Double Colourless Energy back in your hand. If you also have Broken Time Space in play, the entire combo can be back on the Bench and ready to do the same attack the next turn. Of course, you would need to retreat or switch your Active Pokémon. Ambipom has two of his own attacks that are very situational, but have the ability to be quite disruptive to the opponent. Both cost only 2C and so can be powered up in one turn with a Double Colourless Energy. Played onto the Bench, Unown Q can be attached to a Pokémon as a Tool and allows the Pokémon to retreat for one less energy. As Houndoom requires only one energy to retreat, this effectively makes Houndoom into a free retreater. Chanot G is a great starter for this deck. Not only does his Poké-Power disrupt your opponent’s set-up by allowing you to re-arrange his top four cards, but his no energy attack lets you search your own deck for a Trainer (like Memory Berry or Plus Power) and he goes back into your deck. Almost everyone is familiar with Uxie’s uses. The added bonus with this deck being that, in addition to refreshing your hand, he can go back into your deck after his attack to reduce the size of your Bench. The choice of Trainers and Supporters is geared toward offense and disruption. Team Galactic’s Mars allows you to discard one of your opponent’s cards in addition to drawing two of your own. If you get these early and have an Ambipom in play, you can use his “Charity Tail” attack to force the opponent to discard a further two cards or take 80 damage. The PlusPowers, Memory Berries and Broken Time Space have already been mentioned. Super Scoop Up is primarily to get damaged Houndooms out of trouble. The other cards are mostly to switch out Pokémon or for draw power. The only one I will single out is Underground Expedition. I really like this card because it allows you to choose any two cards (from the bottom four) and you do not have to show them to your opponent. You can secretly amass 3-4 PlusPowers in your hand and then use them at a key moment and catch your opponent unawares. This deck works best by hitting early and hard. Houndoom is weak to Water. So, if your opponent is running Gyarados you are pretty much soggy toast. You have more of a chance against other water decks that require more time to set up. As I mentioned at the beginning of the article, I’m not too sure this deck has the staying power to stand up to the top decks – but it is lots of fun trying to take them down with these two unexpected Pokémon – Hounds and Apes! NICE.Great idea,I like the use of a Ambipom MT. I have now just recently out the 3 SSUs and added in 1 Expert Belt and 2 more Dusk Balls. I thought of Cherrim and may still try it out. I put in the extra Dusk Balls just to try and set up faster – that seems to be the key. In a way, this deck is kinda like running an SP deck, where you need to get set up early and at the same time stop them from setting up – that’s where Ambipom is really helpful if you get him early with a DCE. I really do like Houndoom, although, I feel as though it doesn’t have too much synergy with Ambipom or Aipom. 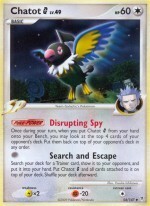 A card you may want to consider is Honchkrow (SV). His power allows you to bring back 1 Pokemon from your opponent discard pile onto their bench if their bench isn’t full. GREAT for keeping your opponent filled with cards on their bench. Same with the Chatot G, it’s just not good enough of a card to use on it’s own, assuming your opponent will use a supporter their next turn and shuffle their deck, or just Claydol ALL their top cards anyways. As for trainers, I’d drop Professor Rowan and Dusk Balls, and 1 Underground Expedition for 4 Bebe’s Search ( Or Mix and match that with Pokemon Communicator). That should just add even more consistency. I play houndoom/infernape so I can get damage on pokemon early to use the burn. I also have some crobats in my deck to place damage as well. I have never really played this competitively, but it’s a fun league deck! I also play the Uxie lvl X for drawing power. I like tragicmat’s Honchkrow idea, that seems like it might be a little better with Houndoom. I don’t really see too much synergy with Ambipom to be honest. What do you send active if you bring Ambipom back to your hand? It seems like you have nothing that would be able to stall or take a hit. I’d suggest Mr. 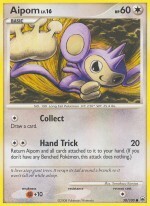 Mime or Spiritomb, but they’re counter-intuitive to Houndoom. Thanks again for the article Dave! Thanks again everyone for all the good suggestions. Adam, you make a valid point about this deck not really having a staller that can take some hits. You are not always going to be using “Hand Trick” to bring back Ambipom into your hand though. Sometimes it works better that he is the softener, and when he gets KO’d you bring up Houndoom to knock out their big hitter. If I try a staller, then Mr. Mime is probably the best bet (unfortunately I don’t own any). One thing to keep in mind is how fast you can recover – with Broken Time Space in play you can have a fully powered Ambipom, or a Houndoom that can do 60 damage, back on the bench in one turn. As long as you get an early prize lead you can trade off prizes and take the win by 1 prize card. It makes for a real nail-biting battle! I think it’s a nifty idea and i love the fact that your building a deck out of cards that don’t normally see much play, keep experimenting with it but i honestly think that honchcrow would allow you do devistate allot more then the others. That would make fore a sweet combo. Awesome article! I really liked some of your original ideas by using cards that see little to no play. Awesome article!The fact that you used cards that see little to no play made the deck idea really original! I think you’d be better off trading in the Ambipom line for Dunsparce GS. You can then get away with using just Fire Energies. That way you wouldn’t have to bank on drawing a Double Colorless Energy. Also DCEs don’t help out with your main attacker, Houndoom. If you have an attack that has the condition “if the defending Pokemon has any damage counters on it” you get to do more awesomeness, it screams out Crobat G. I would add one or two bats with 4 Poke Turns. 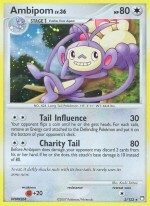 Poke Turns could also pick up a Chatot G and better your chances of having “Revenge Fang” kick in. maybe a shiftry would help with ambipom! 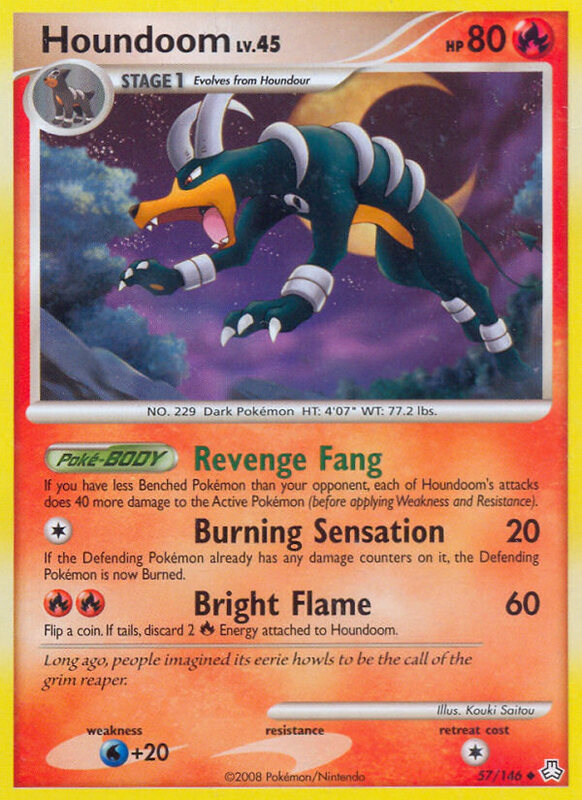 love the ambipom tech in here but houndoom could be replaced with a better card like adam said! Two cards that I have always liked, but fall just a little short of being really good. Is maybe a really good fun deck. Yeah that honchkrow trick may be worth trying. You can use the lv.x and make all murkrows use honchkrows attacks (if i remember the card right). Thats pretty cool. Thanks again everyone. It’s great to have so much constructive criticism – one of the things I love about this site is how respectful everyone is. I do like the Honchkrow idea, as a way of manipulating your opponent’s Bench, although I think it would be problematic early on when your opponent does not have any Basics in their discard pile. If I get some Honchkrows, I will try it out. Honchkrow also has to be active to use the Pokepower, which is not so good. Even with Honchkrow, the deck still needs some kind of staller, as Adam mentioned. I thought of using Shedinja SV (Poke-body: prevent all effects of attacks, including damage – done by an attacking Pokemon that has any Poke-Powers or Poke-bodies). That covers most of the heavy hitters in the current metagame. He is a Stage 1, but has only 1 retreat cost. I’m going to try running a 2-2 line and see how it works. I tried this deck at league today with a 2-2 Shedinja tech and it really helped out as a mid to late game staller/closer. At several points I was able to completely shut down my opponent’s offense because they only had powered up Pokemon with Poke-powers or Poke-Bodies. That gave Houndoom and Ambipom enough room to come back for the victory, or in one case Shedinja was able to close out by taking out damaged Pokemon. Surprise is a big factor. It’s biggest counter will be having an opponent playing Warp Points or Pokemon Reversal. Nice to hear you had some success with Shedinja! Are you going to try Honchkrow at some point too? Right now I only have 1. If I get a few more I will, although I’m less enthusiastic about it since I read that he needs to be active to use his Power. I only run 1 Unown Q to try and avoid bad starts, so it would be less flexible in being able to move Houndoom active than when using Aipom. Thank you for such a fantastic blog. Wherever else could a single get these kinds of facts written in such an incite full way? I have a presentation that I am just now working on, and I had been searching for this kind of information.